For many people around the world, gambling is a relaxing and enjoyable experience that they indulge in from time to time. For most gamblers out there it remains a hobby, so entertainment every now and then. However, for some out there it turns into something much worse as they develop a gambling addiction, creating serious problems in their lives that threaten to destroy their families and their financial security. What exactly is Gambling Addiction? A gambling addiction is very similar to any other impulse-control disorders where the person is unable to control their actions, even when they know that it is harming them and others. A gambling addiction is therefore not that different from a pyromaniac, who compulsively sets fires, or a kleptomaniac, who steals. 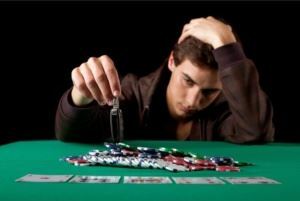 Compulsive Gambling: When someone thinks of gambling addiction, this is likely to be what they picture in their head. A compulsive gambler has no control over their gambling and will carry on betting money no matter the consequences. They will often look for any excuse to make a bet, even when they are fully aware that the do not have the available funds to cover the bet if they lose. Binge Gambling: Binge Gambling is not as immediately obvious as Compulsive Gambling; however, it shares many of the same symptoms. Here the person will act like a compulsive gambler, but only for certain periods of time. This can give the illusion that they have their gambling under control, as they can go weeks or months without gambling. But once they start gambling, they act as a compulsive gambler. Problem Gambling: This is the least extreme type of gambling addiction on this list, where the player isn’t completely addicted to gambling. While they may not be a compulsive gambler, their gambling still causes them some problems in their life. This can be identified by someone who chases their losses, lies to their families and starts to realise that they’re gambling more often and they cannot, or do not want, to stop themselves. This is a very difficult question to answer because the only way to really tell is if the player or their family identifies the symptoms. There have been several studies and attempts to determine how many players suffer from gambling addiction and they all seem to come to a similar conclusion. The most widely reported and accepted figure for problem gamblers sits at between 2 and 3%. The compulsive, or pathological, gamblers are even rarer with this affecting roughly 1% of gamblers. Having said that, these figures tend to be a bit higher in areas of the world where gambling is a bigger part of life and people’s culture, like Las Vegas. To some people it seems like it is going to be extremely easy to identify a problem gambler, but in many cases the signs of a gambling addiction go unnoticed. In part, this is because the gambler is often able to rationalise many of their problems, which in turn helps to hide the problem itself. The person is constantly thinking about gambling and when they can gamble next. A gambling addiction is a serious issue that can put your family and their financial security at risk. If you, or someone you know, exhibits some of the symptoms above we highly recommend you seek assistance immediately. There are countless websites and helplines available around the world, so please seek help if you think you might need it.